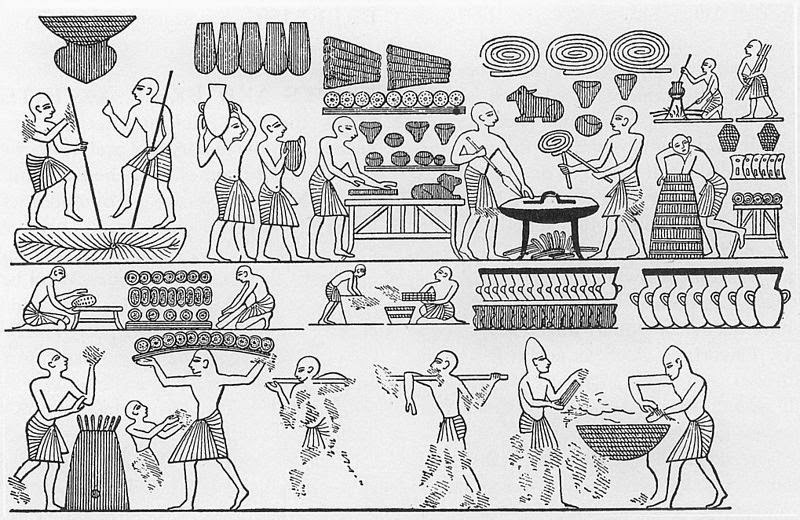 In today's post, The Historical Cooking Projects' Editor in Chief, Alex Ketchum, explains the important role food played in her dissertation defense. 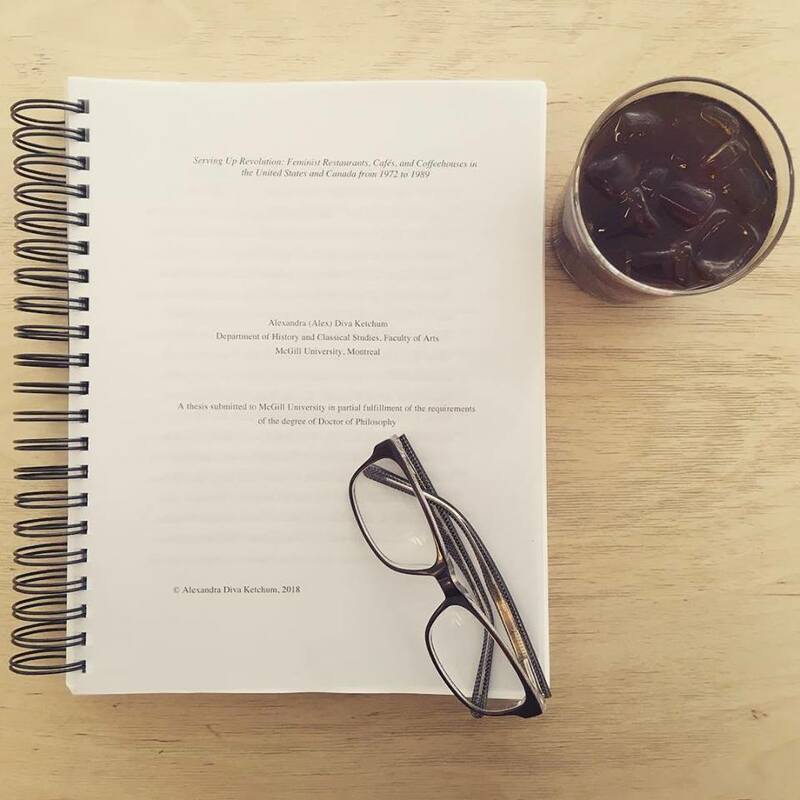 On June 5, 2018 I defended my PhD dissertation, "Serving Up Revolution: Feminist Restaurants, Cafés, and Coffeehouses in the United States and Canada from 1972 to 1989." It is the first history of the more than 250 feminist and lesbian restaurants, cafés, and coffeehouses that existed in the United States during the 1970s and 1980s. It emphasizes the importance of physical space for socializing, activism, economics, and community building. 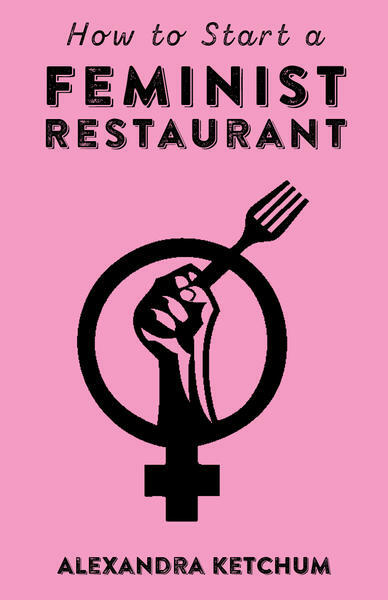 Feminist restaurants produced fertile environments for political organizing and activism. 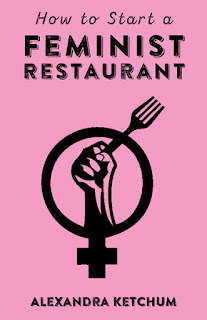 The history of feminist restaurants, cafés, and coffeehouses in the United States and Canada is a history of business practices, political activism, and food politics. This dissertation places these eateries within the greater context of twentieth century American feminist political economy. Bolstered by the creation of mapping interfaces, this project re-centers feminist entrepreneurialism and challenges narratives of post-war feminism. As everyone at the table had read the dissertation and those in the audience had at least had to hear me talk about the project ad naseum, I didn't spend much time recapping the project. Instead, during my presentation, my goal was to elaborate on what wasn’t on the page—what couldn’t be expressed in words and to go into further detail. I discussed why I chose the definitions I did, why I organized the chapters in that way I did, and the arguments I would like to expand upon in further work. Additionally, I wanted to bring in what sheet and ink could not. As feminist restaurants and cafes engaged with their communities by sponsoring guest speakers, concerts, poetry meetings, and art shows—engaging their community through audio, written texts, images, and textures, I hoped to provide the same multi-sensory experience. 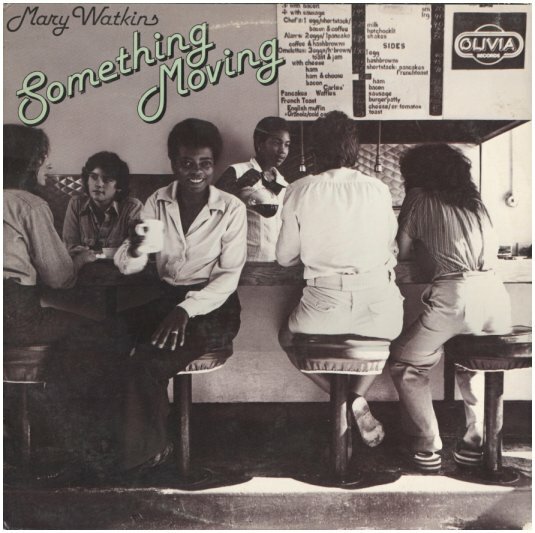 I began my presentation by playing the first 90 seconds of the song, “Brick Hut.” It is the third track on Mary Watkin’s 1978 album “Something Moving.” Watkins, wrote the song about the Brick Hut Café of Berkeley, California which was in business from 1975- 1997. The cover of the album shows Watkins sitting at the counter at the first location of the Brick Hut Café, which lasted from 1975-1983, until the owners had to relocate. As you can see in the picture, the original menu was small. It was painted by Peggy Mitchell of the all woman rock band BeBe K'Roche, on a board attached to the hood above the stove. The lesbian feminist record company, Olivia records, produced both BeBe K’Roche and Watkins’ albums. You may ask yourself, why I started my presentation about feminist restaurants and cafes with a discussion about lesbian feminist musicians and record companies. Feminist restaurants, cafes, and coffeehouses served as cultural and social centers for feminist and lesbian feminist communities. These businesses served as concert venues for musicians like Watkins and lesbian folk singer Alix Dobkin and locations where women could work as out-lesbians. These restaurants provided economic opportunities both for the people working there and affiliated businesses and artistic and cultural ventures. The owners of these businesses wrote cookbooks and produced other cultural ephemera. IMPORTANTLY they flipped the narrative of the kitchen as an inherent site of women’s oppression and showed the empowering potential within cooking. To talk about restaurants and food, especially during lunch time, without having any of the actual food there would have felt inappropriate. So while I spoke, I passed around cupcake versions of Sourdough Chocolate Devastation Cake. I included a photocopy of the recipe with the cake. 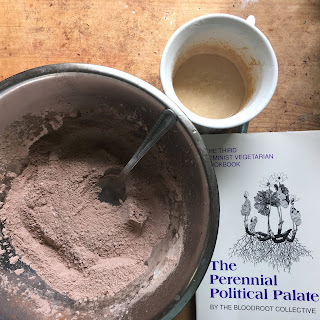 The recipe comes from the cookbook The Third Perennial Palate which was the third in a series of now six coobooks written by the Bloodroot collective of Bridgeport Connecticut’s Bloodroot Feminist Vegetarian Restaurant and Bookstore, founded in 1977 and which is still in business. For those with dietary restrictions, there was little to worry about! It is vegan and as the audience could see the ingredients on the recipe going around, there are no nuts. At the bottom of the recipe there are quotes that the authors included in the cookbook, citing other feminist authors that inspired them. This recipe too speaks to the deep interconnection between feminist restaurants and literary culture—both through the actual production of the cookbook and the promotion of other authors, scholars, and activists. My cooking the recipe also served as a reminder of the role of the historian. Just as I had to interpret the recipe despite not having access to all of the information such as what brands and sources of ingredients the writer intended, when I began researching feminist restaurants, cafes, and coffeehouses there was no list or database already in existence. I had to parse through what information I had available which included lesbian and women’s travel guides, such as the Gaia’s Guides, which I made available for viewing. I had to comb through periodicals and look for advertisements and articles. 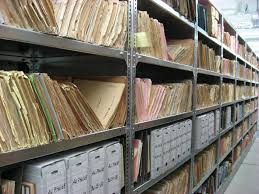 I also relied on interviews with former owners and staff members at these businesses and was referred forward to other interviewees through the help of restaurant owners, archivists, and lesbian feminist Facebook forums and pages. 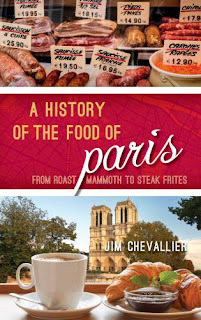 Doing food history allows us to access the past on multiple levels. My defense was successful and I have now completed my doctorate! Thank you to everyone who has supported my research over the past 5 years of the PhD, 1 year MA, and my early work on the project during the last two years of my BA. "Memory Has Added Seasoning: The Legacy of Feminist Restaurants in the United States and Canada." in peer review for Anthropology of Food. forthcoming in 2018. “Restaurant Management” in Albala, Ken. The Sage Encyclopedia of Food Issues. Sage Publications, 1203-1206. 2015. Find out what's being written and said about The Feminist Restaurant Project!